Announcement In a world of mass production, where you have seen it all, ingenuity coupled with spirituality and a personal touch goes a long way. The materials used are glass and stone. Being environmentally conscious, ODEHYA believes only in local made and is not intending to outsource the manufacturing to other countries. ODEHYA focuses on designing and producing jewelry, as well as personalization. All items are hand made, and cared for with love. In a world of mass production, where you have seen it all, ingenuity coupled with spirituality and a personal touch goes a long way. Hamsa Necklace on Marble with Sterling Silver (Gold Filled). 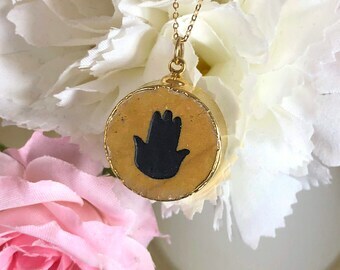 Hamsa Hand Necklace. 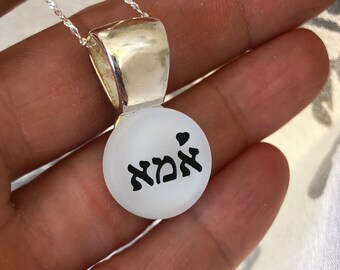 Jewish Necklace. Gift for Her. Unique Spiritual Gift. Mom Necklace, Mothers Necklace, Mom Jewelry, Mothers Day Necklace, Mothers Jewelry, Made in Olive Green Small Glass. Pin if you like it. 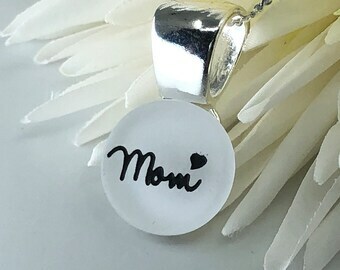 Mom Necklace, Mothers Necklace, Mom Jewelry, Mothers Day Necklace, Mothers Jewelry, Made in White Glass. Pin if you like it. 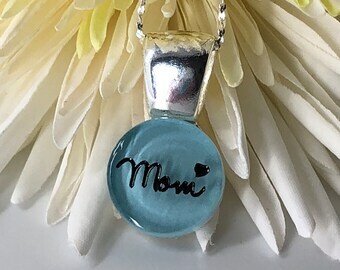 Mom Necklace, Mothers Necklace, Mom Jewelry, Mothers Day Necklace, Mothers Jewelry, Made in Turquoise Small Glass. Pin if you like it. Evil Eye Bracelet made in Jerusalem Stone. Eveil Eye Jewelry. Kabbalah Bracelet. Leather Wrap Bracelet. Spiritual Jewelry. Men Bracelet. 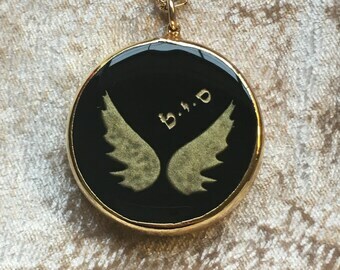 Angel Wings Necklace, with Kabbalah 72 Name of God 925 Silver with Gold filled Around Black Glass. Spiritual Gift. 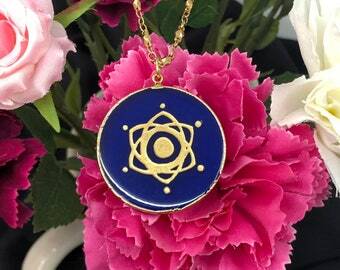 Circle Pendant. 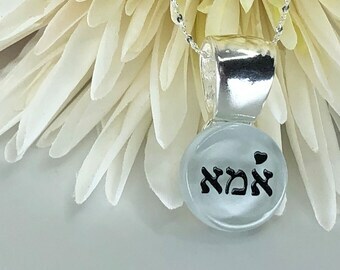 Shema Israel Necklace Made in Glass -Sterling Silver Chain or Black Silk Cord, Original and Unique, Different Sizes and Colors. Hai inside a Star of David Large Sized Glass Necklace - Original & Unique Gift, Eight Different Colors. Pin it if you like it! It is a beautiful ring, thanks! My first art piece that inspired this whole wonderful adventure. Titled Love, which is what's injected in every piece. My first batch of jewelry - I couldn't believe how beautiful they turned out to be. I was so excited, and still am. I take pleasure in every step of the way, including the photos I take of the products. One of my favorite products, not only because my son insist on going to sleep with it on. It's just so pretty!! The owner and designer Rahel Tennenbaum, was born and raised in Jerusalem Israel. Rahel was inspired by the surrounding natural fields and buildings, where it's a city law to build the outer-face of all structures with the local "Jerusalem Stone" (a material she now likes to use in her art and jewelry). She was a graphic design student (excelling in the arts) and supported herself working as a flight attendant for ELAL (the Israeli airline). Rahel has been influenced by the power of spirituality and volunteering since 2000. While temporarily living in Arizona she took art classes and made her first unique wood art piece with the word LOVE in Hebrew. That piece attracted great reactions and many requests for orders. That inspired her, after settling in Los Angeles, with much support from her husband Ely, to create the ODEHYA brand (her given name by her parents - which means Thank God) that focuses on positive and spiritual values. After a few years being nagged by friends to make jewelry as well as art, at 2013 she finally launched that long awaited unique and original jewelry line using materials like glass, Jerusalem stone and marble also with spiritual and positive designs, and available for reasonable and affordable prices. All of the design is done exclusively by Rahel, and production is split between her and her trustworthy subcontractors, all with hands on approach, where she overlooks all steps with great care. Rahel Tennenbaum was born and raised in Jerusalem Israel. After moving to Los Angeles she founded ODEHYA creating art and a unique jewelry line made with Glass, Wood and stones with positive values, and available for reasonable and affordable prices. When I make any of my pieces, and need help, I don't want to settle, and having Hayk as part of my "team", is a great merit, being in the jewelry metal smith profession for a few decades, passionate, detailed oriented, and loving. Craig is a passionate wood worker who worked with wood most his life, including getting educated at The American Woodworking Academy. He is a pleasure to work with, as a person and as a professional. I know I can trust everything he makes. Shelly has been an incredible help when it comes to making my art pieces look perfect as they are. We are not only working together in harmony, but we are also friends. When I leave her shop I know my "babies" are in good hands, and I feel gratitude. The wonderful gold wrap around in this line would not be possible without the skills, love and experience ODEHYA get from Kim, who is a leading skilled and experienced jeweler for the last 30 years. Thank you so much for visiting my shop. My art is designed to fit the customer, and so I'm only satisfied when you are truly inspired every time you look at it. Please contact me with any questions, or comments about what you see or what I can do to make my art come alive for you. The products in my shop are not “mass” produced. Each one is individually designed and created one-by-one by the artist. As a result, great pride, skill and a lot of thought go into each art piece. However, if you are not completely satisfied with your purchase when you receive it, you may return stock items (not custom orders) within 30 days of delivery for a full refund. Items should be returned in their original product packaging. If the return is a result of our error, we'll also pay the return shipping costs. Returns that are not the result of our error will be subject to a return shipping fee which will be deducted from the refund. Please contact us and we will guide you through the process. You should expect to receive your refund within four weeks of giving your package to the return shipper; however, in many cases you will receive a refund more quickly. Sorry but we cannot accept returns of custom ordered products. Partial Refunds may be offered for items returned more than 30 days after delivery, that have obvious signs of use, or not returned in the condition it was received. If you received a faulty item and need to exchange it for the same (or equivalent) item, please contact us. If you would like to exchange an item for a different one, please follow the returns policy before placing your new order. I'm really flexible. I can accept payment by PayPal, credit card, money order or even personal checks. Taxes will be added to all orders within the state of California. Shipment will be arranged once the payment has been received and confirmed. 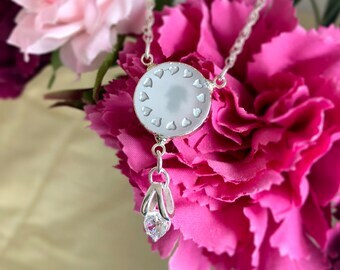 Custom orders cannot be cancelled once the design is finalized. Orders for stock items can be cancelled before being shipped with no cancellation fee. Shipment is typically by USPS first class or priority mail and arranged within 2-3 days of receiving payment for stock items or completion of a custom order. I package my items very carefully or even use professional packers when necessary. Please let me know if you have any special shipping or packing needs or if a rush order is needed and I'll do my best to fulfill it. In some cases additional fees may apply. Artwork is warranted for life of the original owner against workmanship and material defects, excluding, but not limited to negligence or damage caused by sources outside my control - such as damage caused by the forces of nature, etc. Should your piece need repairs for any other reason, I will be happy to examine the damage and will grant a fair estimate if possible. Please contact me for details. I sometimes sell products that have been returned from customers, are slightly damaged, have been repaired, or contain other defects that may result in an offer of savings on the original purchase price. I guarantee that the product description on the website will accurately represent all visual defects. These products are warrantied against visual discrepancy with the description only for a period of 14 days. Due to the condition of these products, particular care must be used when unpacking, handling or mounting. Sorry but I can't provide a warranty on the workmanship and material defects beyond normal handling in the first 14 days.